Our Products >> Tropical~Exotic Arrangements:A Bit Of Paradise To Say It All! When You Want A Bit Of Paradise Select A Tropial~Exotic Arrangement To Brighten And Cheer Up Someone's Day. 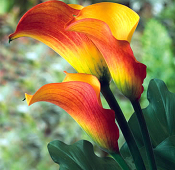 We Carry A Wide Variety Of Tropical Flowers~Due To Seasonal Availability Flower Selection May Vary. If You Do Not See What You Have In Mind, Please Call 312-243-9949 To Speak With A Designer To Customize Your Order. A Mixture Of Tropical Flowers And Foliage Arranged In A Classic Matt Black Vase~Send This To A New Business Opening~House Warming~Looking Forward To Seeing You~Big Apology~This Arrangement Says It All And Covers It All~You Will Impress! A Beautiful Double Phalaenopsis Orchid Plant Potted In A Clean Black Matte Container With Curly Willow-River Rock & Moss. Certain To Impress For Any Occasion! A Stunning Combination Of Cymbidium Orchid & Exotic Tropical Flowers~Send This To Make A Statement! A Great Send For Any Occasion! Dinner Party~Open House~I Love You~Let's Go On Vacation~Thank You! Our Designers Will Create A Beautiful Tropical Arrangemet From Our Available Product~Select This Option And We Will Add $5.00 Additional Flowers At No Cost To You! Calla Lilies make a great statement of simple elegance. Send these to express Grace~Beauty~Great as a House Warming Gift~I Love You~Thank You~For A Contemporary Individual~Always A Winner. Elegant Dendobium Orchids And Tropical Foliage Inside A Large Clear Cylinder~Zen~Elegant~Great For All Occasions! Men Love This One! Make A Statement! A Beautiful Cymbidium Orchid Inside A Clear Cylinder With Tropical Leaf And Polished River Rock Zen-Contemporary-Simple Stated Elegance-Send This As A House Warming-Congratulations-Happpy Anything!